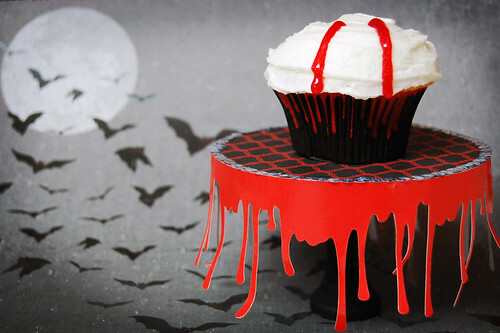 If you are a fan of Twilight, then you’ll love this spooky and sparkly vampire Edward Cullen cupcake stand! As soon as I saw this Martha Stewart dripping border at my local Joann, I just knew I had to buy it and make a cupcake stand with it! I just think it turned out so bloody fun! If you visit my blog often, you may remember that I did a candy corn cupcake stand very similar to this a few weeks ago. I made that cupcake stand and this one at the same time and I’ve been anticipating showing you this version…I just had to make the perfect bloody cupcake to go on top to match the stand! Didn’t it turn out cute? 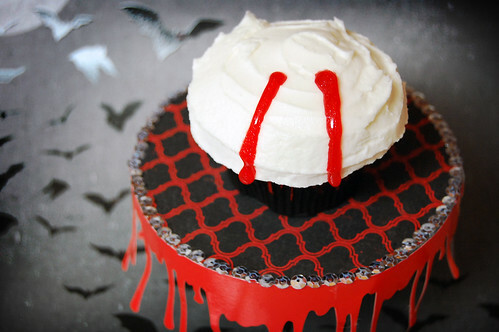 But before I start, here’s a little list of Twilight-inspired cupcake recipes I found you may like that will make the perfect topper to my cupcake stand!!! 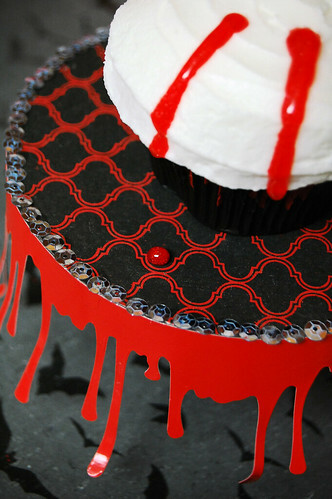 Here’s how you make the bloody cupcake stand! 1. Paint your wooden candle holder black with acrylic paint. Let dry. 2. Trace your CD with a pencil or pen onto red, black, grey or patterned paper of your choice amd cutout. 3. Use Aleene’s® Original Tacky Glue Sticks to cover back of trimmed circle. Press onto CD and smooth out any air bubbles. 4. Use a glue gun to glue bloody trim to sides of CD. You will need to piece 2 strips of trim together to go around CD. Use as small amount of glue as possible to attach trim to CD. 6. Attach wooden candlestick to the base of the stand. Let dry and enjoy your cupcake stand! 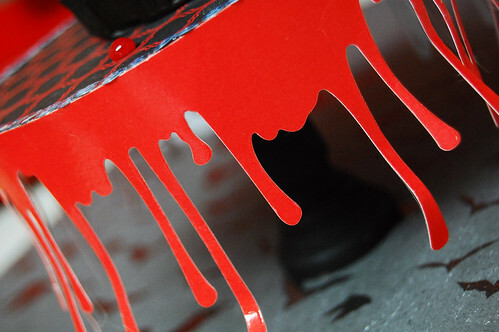 Doesn’t the blood drip trim look amazing?!? Here’s a detail of the silver sparkly sequins adorning the sides of the stand in honor of Edward! I hope I made him proud with this project! Oh, and for the way the cupcake looks, all I did was use sparkly red gel icing. I poked two holes on top of the cupcake ad let it drip down. I kinda love how it dripped onto the paper. Makes this project have extra blood-sucking appeal! P.S. I added this to the following linky parties! Fantastic! 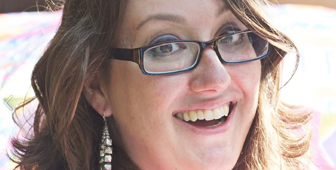 My co-editor (Kristen, at craftgossip.com) sent this to me and I linked on our site (ediblecrafts.craftgossip.com). 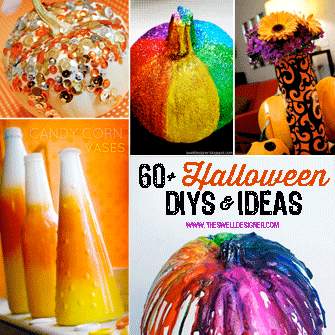 Love the candy corn stand, too! Too cool! I love how you used that Martha scrapbook paper. I’m so glad I talked myself into buying that same Halloween pack.